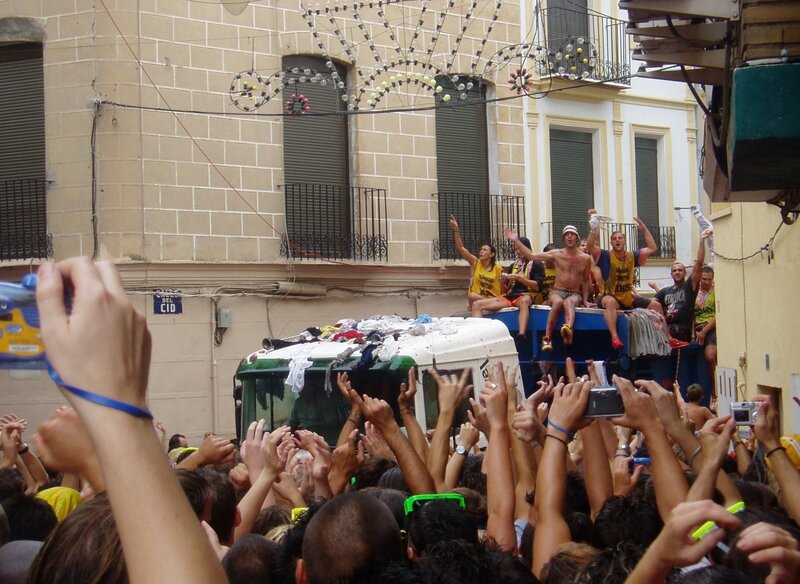 Backpackers and the Spanish know exactly what I’m talking about. 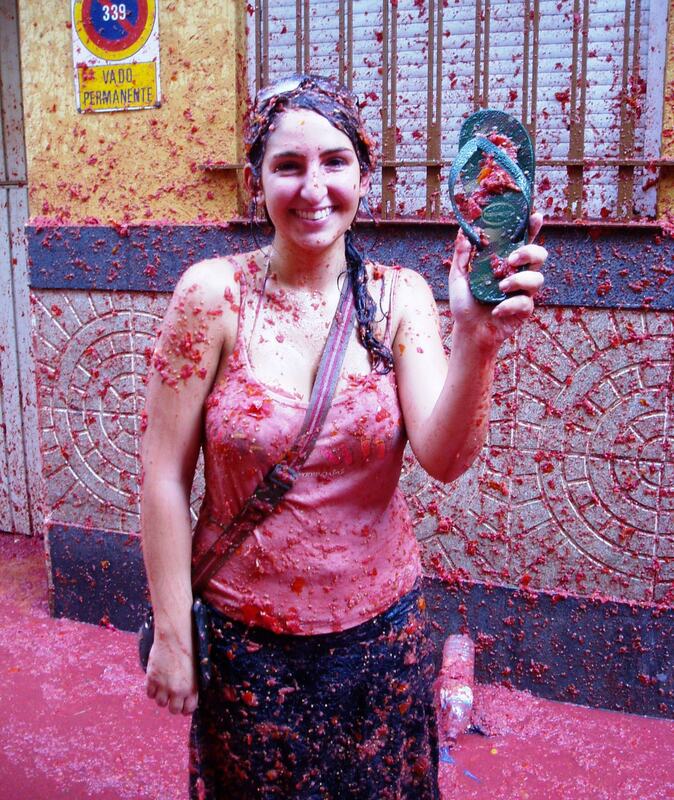 It’s tomato bloodbath time. 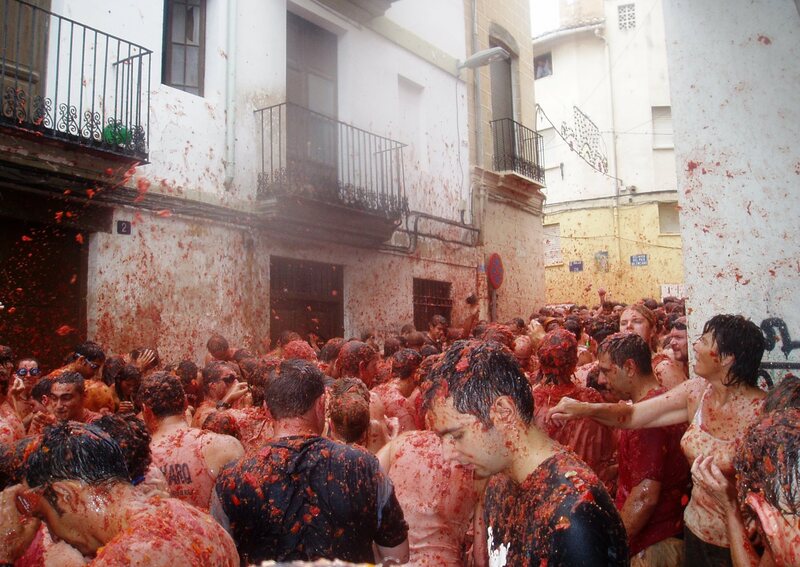 Otherwise known as La Tomatina. 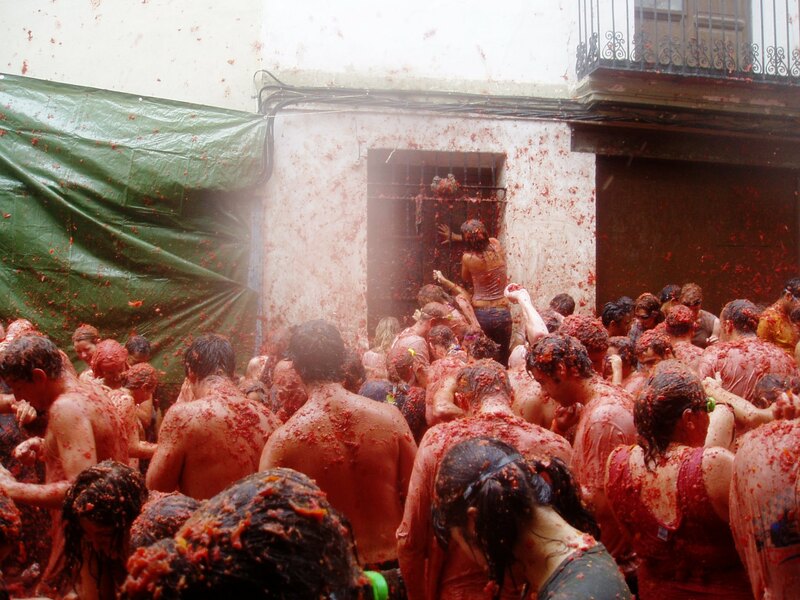 La Tomatina is one of those mandatory European travel experiences, up there with the running of the bulls, camping out for Wimbledon tickets and partying on the Greek islands. 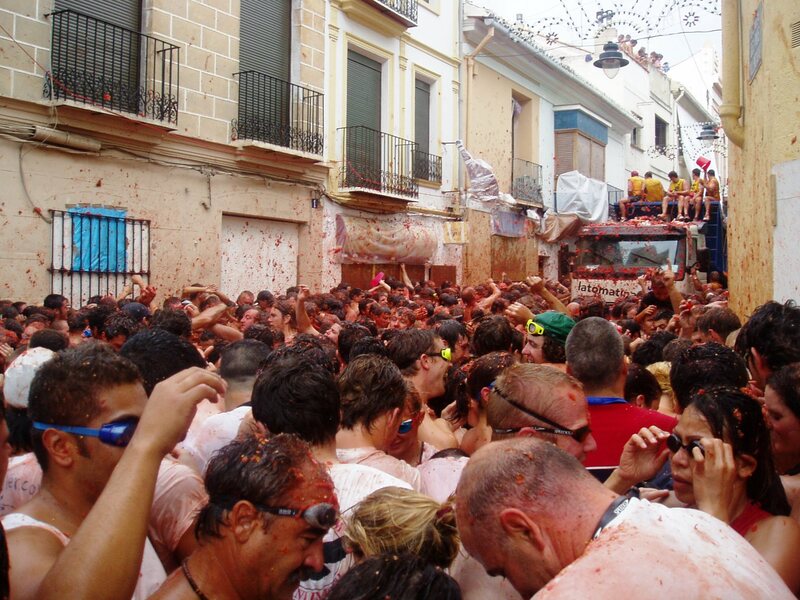 For the uninitiated, La Tomatina is a festival held in the tiny Spanish town of Buñol, about an hour from Valencia. 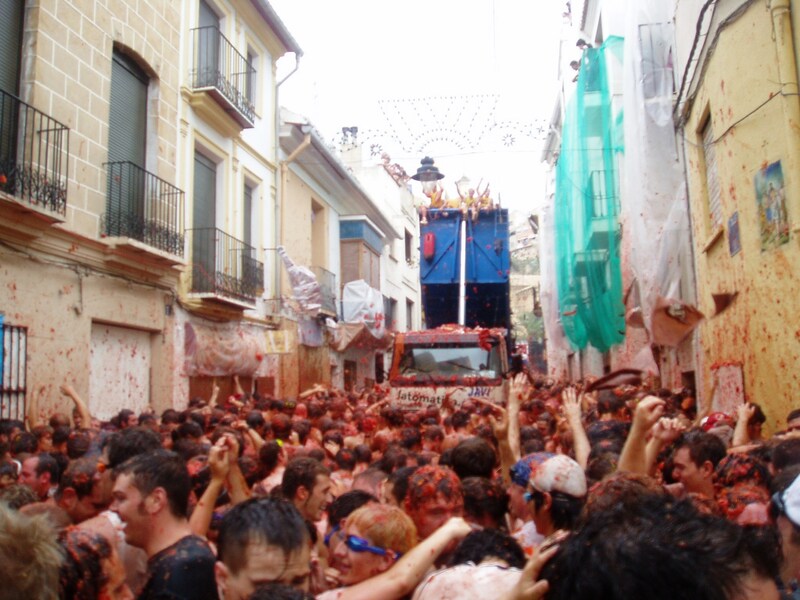 It started in 1945 as an innocent food fight and grew to the point where the town of 9,000 inhabitants was being overrun by 50,000 crazies on the last Wednesday of August each year to get caught in the cross fire of a bloody food fight. 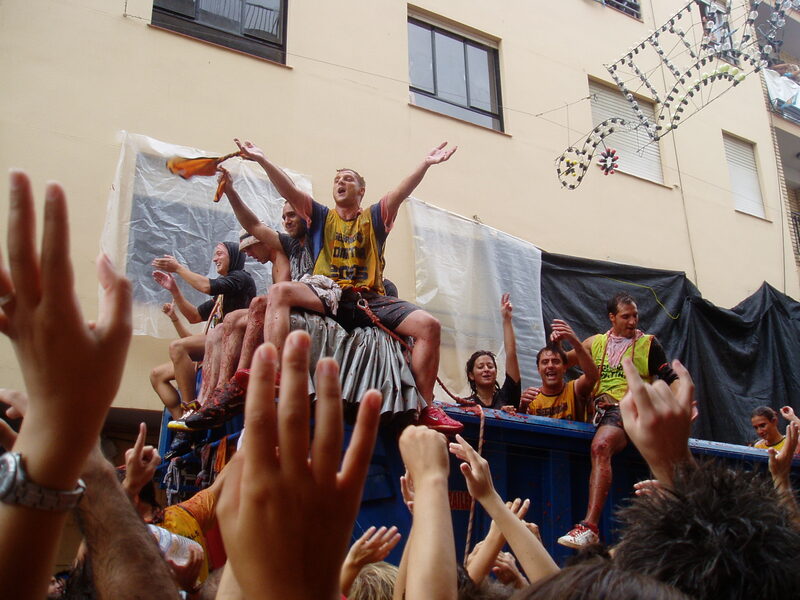 It got so ridiculously big that the town had to introduce a ticketing system to scale it right back down to a more reasonable 20,000 people. So you can’t just rock up like I did with my friend Anna many years ago; have the privilege of being crushed against the side of the road as the tomato-laden truck passes by; practically become blinded by the acid in the tomatoes; and lose almost every piece of clothing in the process. Well you can but you have to be selected first. For anyone that makes the cut, well done you! 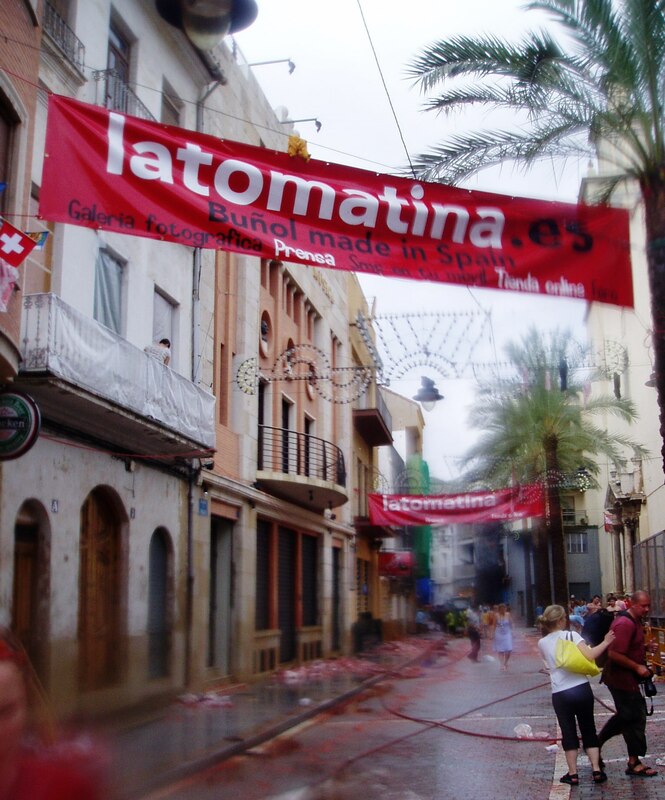 Here are my ten tips for surviving La Tomatina. 1. Don’t take a camera. At least don’t take a camera you want to be sure you’ll take home in working condition. I’m still glad I did take a camera (yes this was back in the day when people had actual cameras rather than just using smart phones) because it captured these shots that are priceless to me. However the second people saw me with a camera I became an instant target and everyone wanted to take the camera (and me) down. In retrospect I should have kept it in a plastic bag for protection. By some miracle, the camera survived although I did find random pieces of dried tomato wedged in its crevices for months to come. 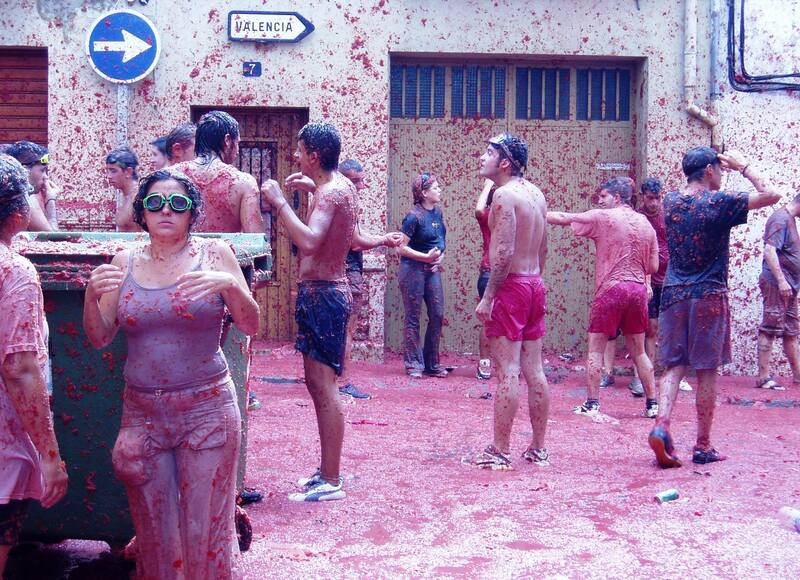 The food fight has well and truly begun! 2. Wear industrial strength goggles. Oh how I wish someone had told me this and I’d listened! The day before, Anna and I stocked up on supplies in Valencia and she was smart enough to buy goggles, I thought I’d be just fine with sunnies. How foolish I was. 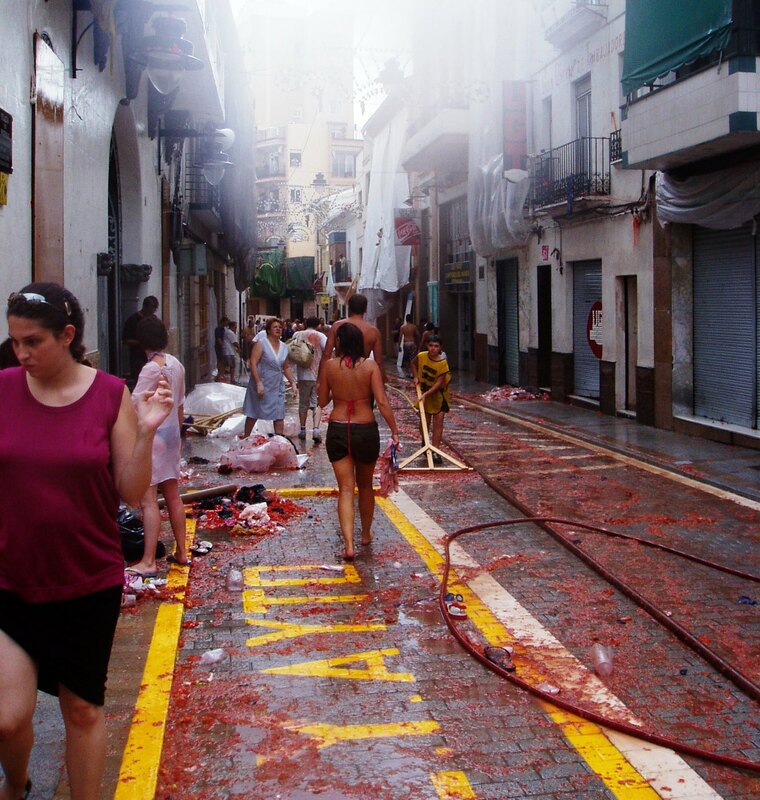 When tomatoes are being hurtled at 100 miles an hour in every direction, no one is looking out for your eyes and every body part is fair game. 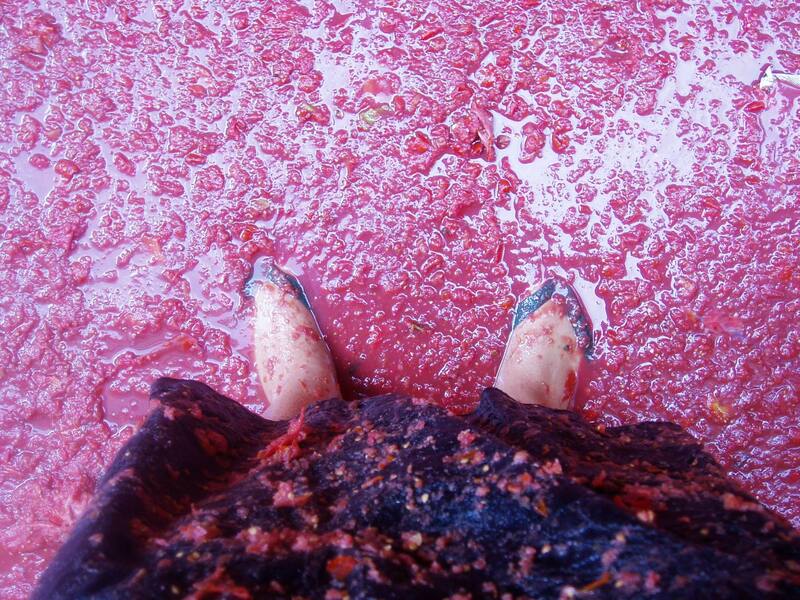 I got tomato juice in my eyes within the first two minutes and was helpless to do anything about it given my hands were covered in crushed tomatoes. 3. Wear clothes under your clothes. This one is one for the girls because boys will try to rip your clothes off in the ‘spirit’ of the festivities. 4. Don’t try and get the ham. That’s the ham strung up on a greasy wooden pole, the claiming of which kickstarts the shenanigans. Although if you ask my friend Jeremy he will contradict me on this, purely because he did get the ham last year and lives to tell the tale. But you may not and end up falling to a porky death so don’t risk it! 5. 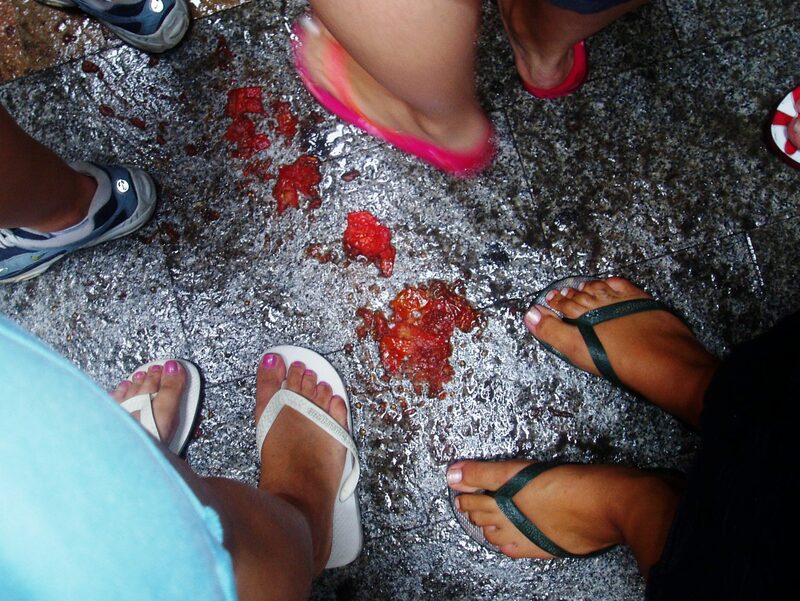 Wear shoes that won’t easily come off. Again I thought I’d be just fine and dandy in thongs (that’s flip flops to you Poms). 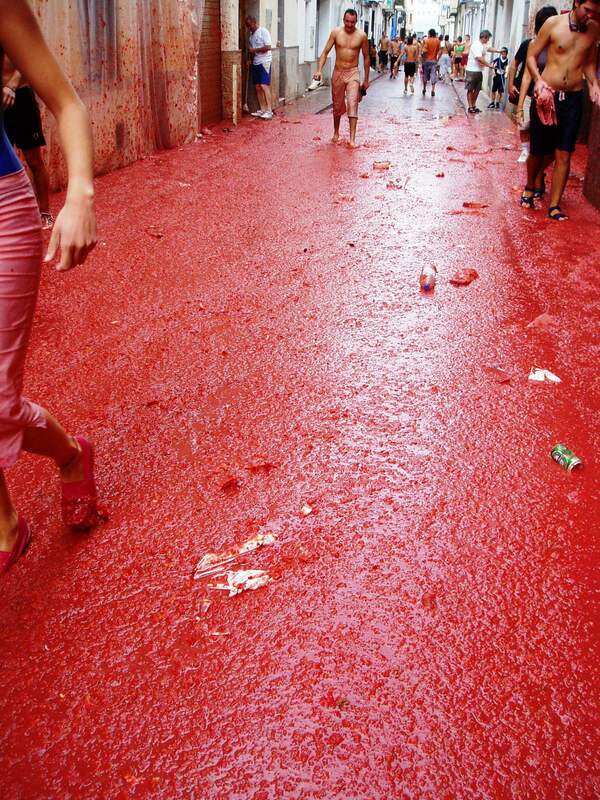 They stayed on my feet for perhaps for the first ten minutes and then one got washed away in a sea of tomato juice. Reunited with my long lost shoe! At the end of the carnage as we washed ourselves back to normality we found a massive mound of orphaned shoes and in the biggest miracle I’ve seen to date, my missing thong was sitting pretty in the mound. Someone up above was looking out for me that day. 6. 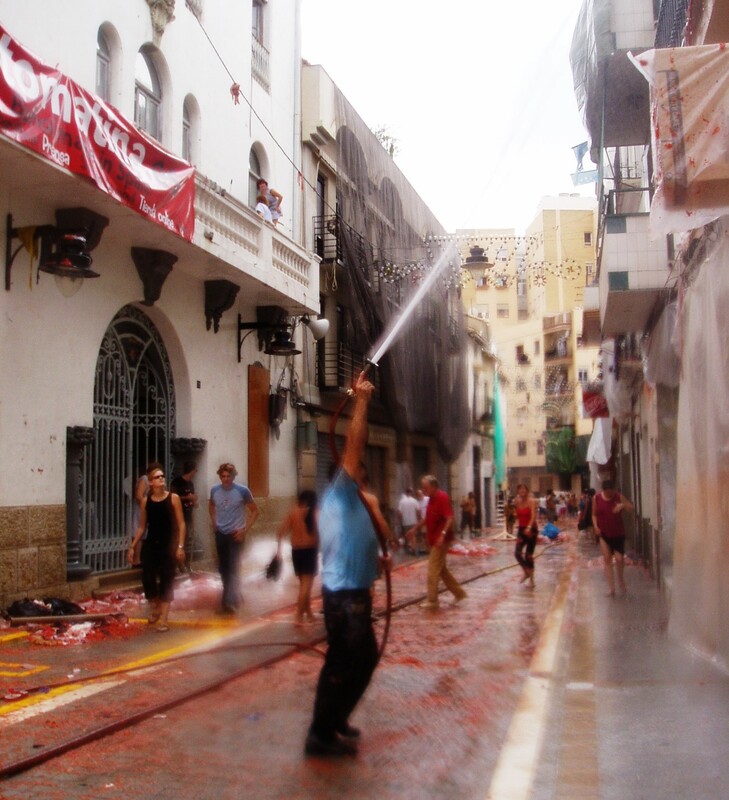 Have a decent-sized breakfast that morning to ensure you’re energised but hold out for a big plate of steaming paella on your return to Valencia. 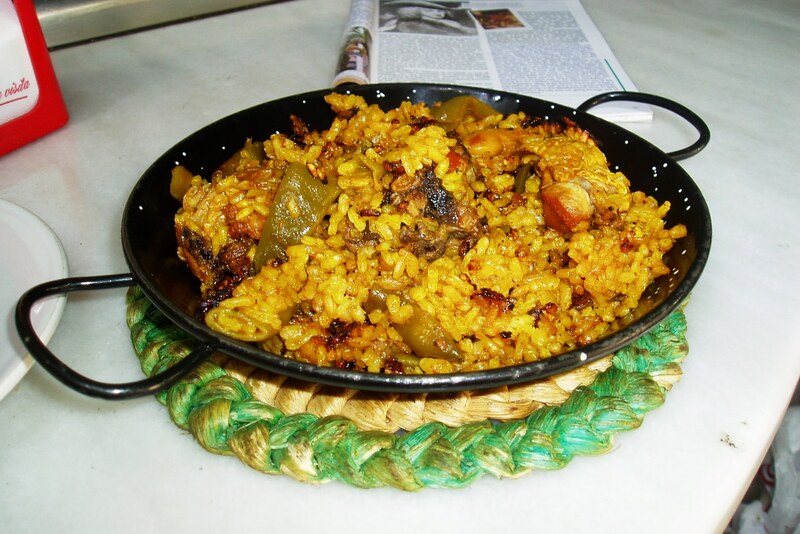 As the birthplace of paella it’s the best place to try this delicious rice dish and I guarantee you will be ravenous after all that tomato malarkey. 7. Wear clothes you never plan to wear again. Trust me, once your clothes are seemingly blood-stained and smell like a can of tomato soup you’ll never want to see them again! 8. 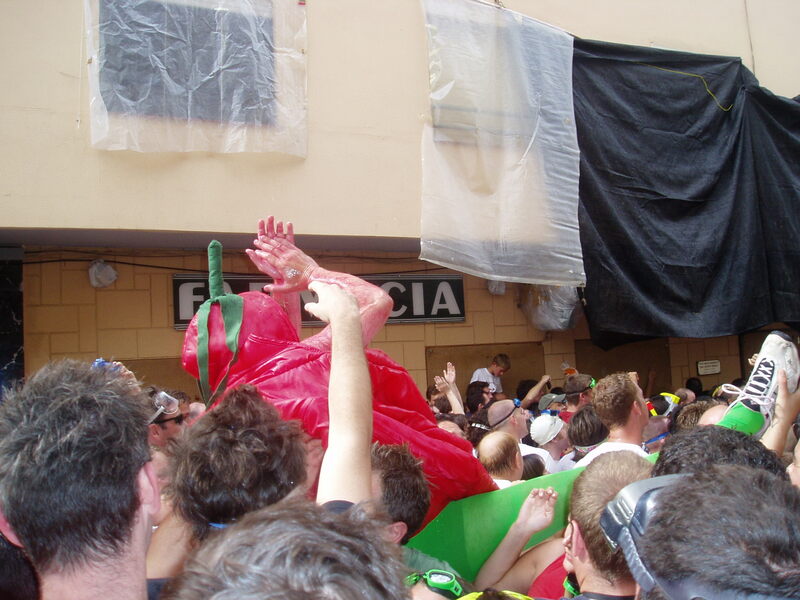 Fancy dress will bring you lots of new friends. Whether it’s a tomato-themed costume or exotic headwear, a bespoke outfit will show you’re definitely getting into the spirit of things. 9. 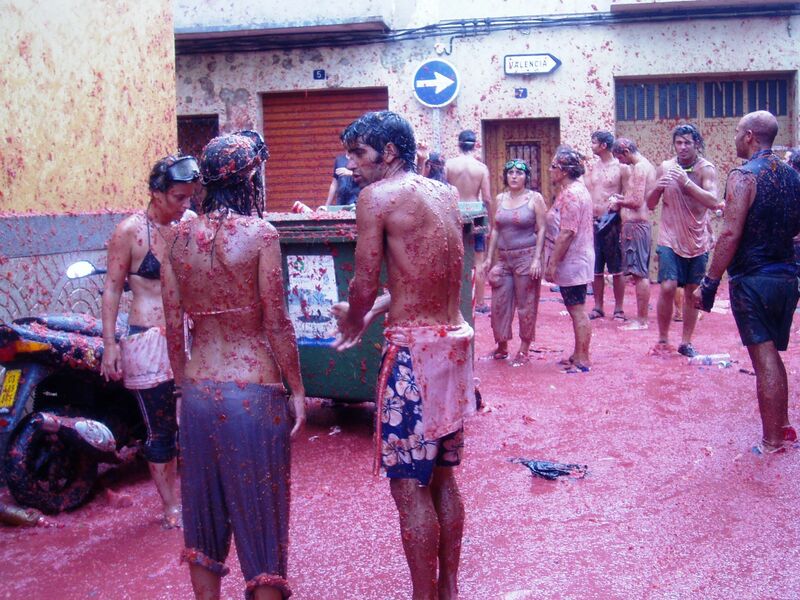 Do commemorate the occasion with fellow La Tomatina-ites in the days afterwards. You won’t have a problem knowing who they are – just look out for anyone with pimples all over their body. That’s what happens when you expose your skin to the rather harsh acid in tomatoes for hours on end and it becomes somewhat of a badge of honour. 10. Book a decent hotel for the night of the event with your own bathroom. This is the one time a shared room of 20 and one shower is not going to cut it because you’ll want to spend a few hours detoxing. 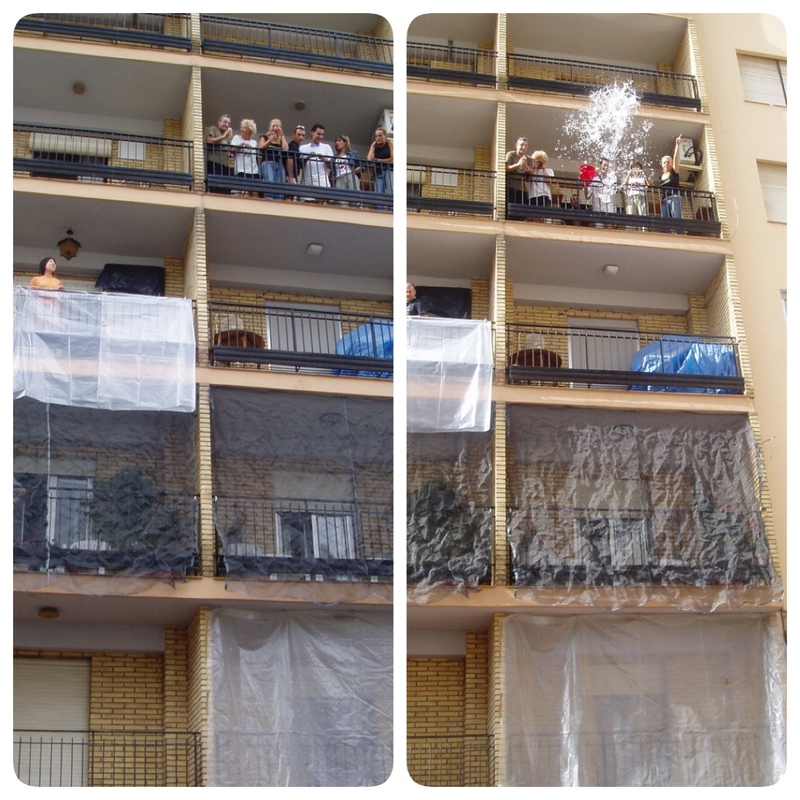 Anna and I got lucky and were upgraded to a suite at our Valencia hotel so we spent much of the rest of the day scrubbing off the damage with the extra soap the staff had kindly provided for us. 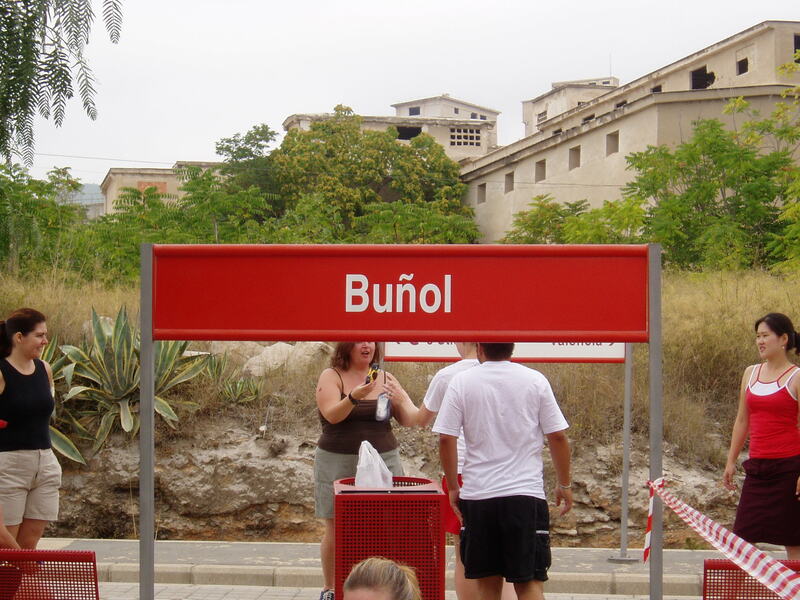 Bunol is almost restored to its original self. So tell me, did anyone get tickets this year?